Chart: State-by-State Enrollment Comparisons by Marketplace Type, 2018-2019. States with state-based insurance marketplaces (SBMs) have consistently outperformed states that use the federal platform in enrollment, affordability, and increased plan offerings and competition, prompting states to consider launching their own marketplaces and Congress to propose new funding to support states that want to transition. New Jersey may become the next state to convert to an SBM, following Gov. Phil Murphy’s announcement of a plan to move off the FFM and create an SBM, which exercises greater control over marketing, enrollment, and plan recruitment efforts than FFMs. New Jersey’s transition follows Nevada, which will become an SBM later this year, and Idaho, which transitioned from an FFM in 2014. View a slideshow exploring how state-based marketplaces outperform those using the federal platform. New Jersey’s plan to become an SBM follows other actions taken to stabilize its insurance market, including enactment of an individual mandate and a reinsurance program. These two policies alone reduced premiums by 9.3 percent this year. Transitioning to an SBM will give New Jersey even greater control over its markets, including the flexibility to fully access marketplace data and to implement policies tailored toward state-specific needs and populations. New Jersey’s SBM would be housed in its Department of Banking and Insurance and begin offering coverage for plan year 2021. The state will finance its transition through a 0.5 percent assessment on marketplace premiums, an amount diverted from FFM user fees, which are expected to drop from 3.5 to 3 percent next year. Once operational, New Jersey’s SBM will use the 3.5 percent fee (generating an estimated $50 million per year) to finance operations and consumer assistance and outreach. Legislation is pending to implement this change. Fueled by growing evidence of SBM success, other states may follow New Jersey’s lead. NASHP is closely monitoring action in the Congress where funds to support states that convert to an SBM are included in the Protecting Pre-Existing Conditions and Making Health Care More Affordable Act of 2019. 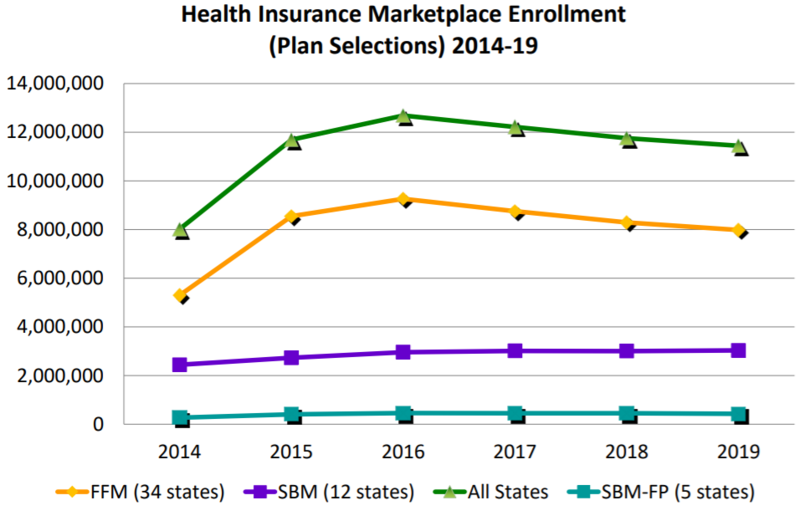 View a chart with every state’s marketplace model and enrollment changes between 2018 and 2019 here and view a slideshow highlighting how SBMs have outperformed state marketplaces that use the federal platform here.